Whether it’s a token of love, a message of thanks, something to enhance a home, a business and an important event in your life. 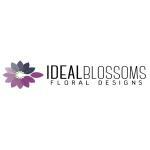 Ideal Blossoms Floral Designs will do it creatively, beautifully and originally with modern and traditional floral arrangements. Selecting premium fresh blooms everyday from our selected and trusted GTA suppliers. As passionate florists, we pride ourselves on the quality of our flowers, our excellent customer service and the value we bring to the clients. Open Monday to Friday from 10am to 5pm and Saturday10am to 4pm creating and delivering stunning floral arrangements for any occasion no matter taste or budget.